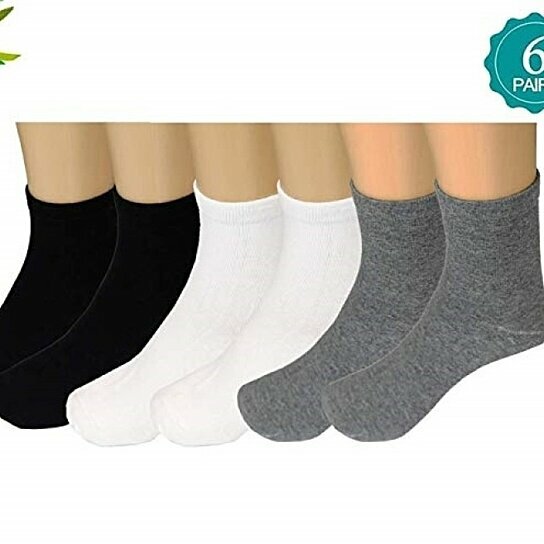 Classic cotton socks made from high quality natural bamboo cotton, enhance absorbency and performance. It can keep your feet cool and dry in any conditions. these socks are soft and thin ,but warm,and fit for four seasons . Natural bamboo fiber could keep baterial away and antibacterial function would remain even 50 times' washing. The middle around part of the womens crew socks is designed to reduce the pressure of the foot,and give your feet good protection. Bamboo Charcoal Cotton could keep baterial away and antibacterial function, you can be confident you'll stay comfortable all day, every day. Material::95% high-quality Bamboo Charcoal Cotton, 5% Elastane.